Patrick and Alex are lost in the woods. So obviously I am a new listener to your podcast because I'm currently commenting on an episode you did nearly 4 years ago, but I wanted to share my thoughts FROM THE FUTURE, kind of, on the "found footage" genre. 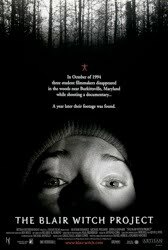 You mentioned in this episode that besides Paranormal Activity and Cloverfield (both of which I love), the genre that The Blair Witch Project brought into the mainstream had not really been expanded/embraced since 1999. Hearing you guys say this in 2010 made the me in 2014 simultaneously chuckle and shed a tear for simpler times gone by. In the years since this episode, the movie universe has been flooded with "found footage," and I am not happy about it at all. I mean with Apollo 18 and The Devil Inside and Chronicle (Jesus Christ) and Project X (Jeeeeeeeeesus Christ!) and now Earth to Echo and Into the Storm, Hollywood has made me severely sick of a genre I once considered to be incredibly clever. I wish your 2010 observations still rang true, because every time I see a trailer for some new movie shot by its characters, I want to throw the Statue of Liberty's head into my Television. That's all I have to say about that. Great podcast. Glad I found out about it. And while I regret being late to the party, it's kind of nice to find something that has hundreds of episodes for me to get through before I run out of new stuff. Keep up the good work. I'll be listening. Hi, Leo! Welcome. We're happy to have you. I don't remember saying that because it was THE '90S (just 2010), but you're right -- I was way off base about found footage. I'm so over it. I'll end up skipping even a movie I might have otherwise wanted to see because of the found footage gimmick. Hopefully it's on its way out and studios choose a new dumb gimmick onto which to hang their entire movies. Great comment -- you're going to fit right in here. Welcome, Leo, and thanks for the comment. The current incarnation of found footage might better be described as faux lo-fi. Recent releases feature edited, multi-camera shots, but with poorly positioned, shaky cameras as shorthand for "real." Earth to Echo and Into the Storm feature video chats as well, and Earth to Echo also includes a mock YouTube video. The obviously staged quality tends to pull me out of a movie rather than create an immersive experience. My comment on the found footage genre starts in 1980 with Cannibal holocaust. For me the first proper found footage horror film. Famous for the found footage style was so convincing. They actually used real dead animals in the film they found by the road. Which im not sure I agree with. But the film was so real looking and filmed the director went to court and was prosecuted with criminal charges against him because they thought it was a genuine snuff movie. He had to bring in the actress with the famous spike down the throat into court to prove it was all false. I hated this movie. I found nothing in it that I like, nothing that works for my, nothing that frightened or shocked me. Not the least little bit. This will go into my personal history book as one of those movie phenomenons I will never ever understand. For me, BWP killed the found footage style right out of the gate (at least if I ignore Dennis` mention of Cannibal holocaust). Since then only a handful of these movies like Cloverfield, Sinister, End of watch or Chronicle worked for me. If this style would die a horrible death right now, I wouldn´t mind. Highly recommend listening to this podcast again. Really interesting listening to you guys talk about the future of found footage films after they have completely worn out their welcome for all of us.